The Water Street Hotel and Marina is beautiful both inside and out. Our amenities are first-class, providing a lifestyle of luxury by the water. The minute you step onto the grounds, you'll lose track of everything but the beautiful natural wetlands and the lazy Apalachicola River. Imagine amazing sunrise views from your private veranda, a marina on site, and an attention to detail everyone dreams about. 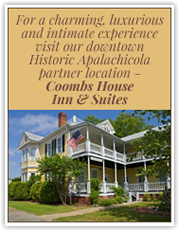 Thirty spacious suites feature full kitchens, two baths and living/dining area with a turn-of-the-century look and feel, right on the Apalachicola River and the world's finest fishing, and a just few minutes to the Gulf's famed white sugar sand beaches. Only four blocks from the town center, the Water Street Hotel and Marina will feel like a world of its own. Ideally suited for families, couples, groups or the business traveler seeking the finest facilities and personal service.